I bet you're a little surprised that I only made you wait two days to see the painting we did at Silo Hill Farm. I know I am the queen of saying "you will get to see that later" then not getting to the project for 6 or 7 months (or never). But in this case, since the point of the visit was to teach Danni to be a furniture painter we HAD to get the projects completed. Danni had a buffet that she bought for (I believe) 10 or 20 dollars. She cut the legs off so it sits like a console in her living room. We decided to use Powder River Paint for this project. Powder River Paint is one of the new chalk/clay based paints on the market. Our good friend Lorraine@Miss Flibbertgibbit is selling it at her shop and online. Danni picked Prairie Grass, a beautiful green - of course. We decided to do the accent painting in Lakota White. We started with this piece because we were using milk paint for the other piece we were painting and I didn't want Danni to get discouraged about painting. 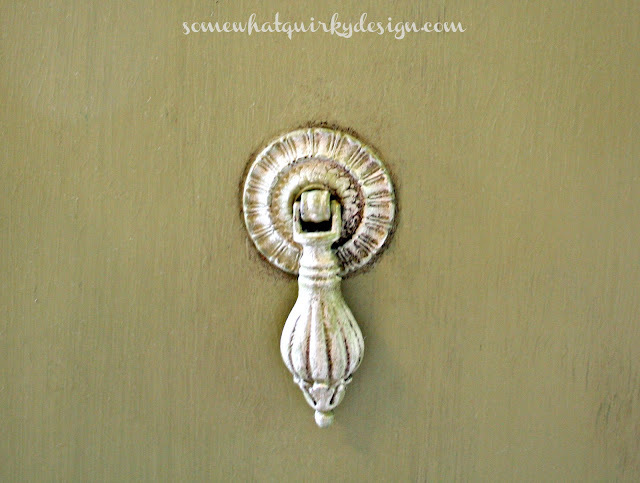 Many of you know that painting with milk paint is a gamble and can be tricky - even for experienced painters. I figured I'd let her get at least one coat of paint under her belt before we started the whole milk paint thing. 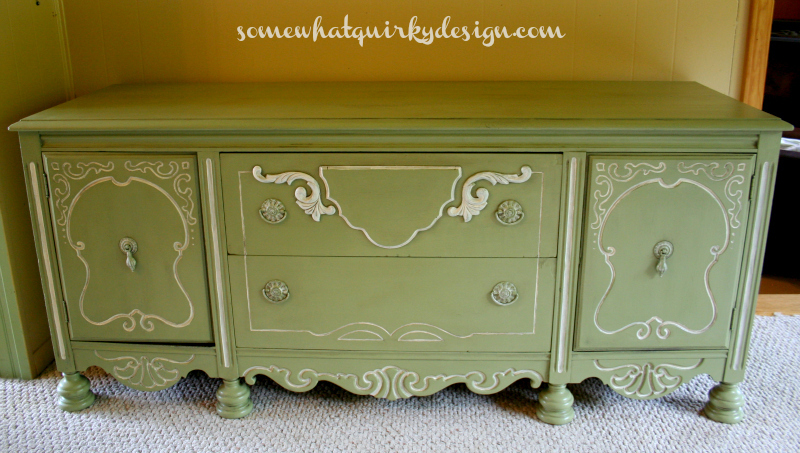 The buffet took two coats of paint. Plus a little extra - that was created when Danni had this small accident. She may or may not have said a few bad words when she did this. I loved the Powder River Paint. It was creamy and covered well. I made Danni use three different kinds of brushes - an Annie Sloan paint brush, a Purdy 2 1/2 brush, and a chip brush. All three brushes worked well with the Powder River Paint. We used Lakota white for the accent painting. It worked fine, but I must say that I think craft paint is the easiest paint to do accent painting with. Painting chalky paint over chalky paint is a little tricky. It tends to drag. A tip here: when you accent paint furniture let go of your need for perfection. You can correct the big mistakes, but don't worry about the small stuff. You could spend hours trying to get it perfect but it never will be. Just do it and move on. We were a little confused by the little wood accent pieces added to the top drawer. We feel sure that someone added them at one time or another. They really aren't consistent with the rest of the piece and Danni kind of wished she had removed them. We weren't thrilled with how bright they looked compared to the rest of the piece. This brightness was emphasized in the pictures. I suggested that she live with it a while and if she really didn't like it, then do a little distressing to bring the color down. Danni didn't want any distressing on this piece. There were a couple of places where the brown showed through the paint and that was OK, but we didn't sand or remove any of the paint before waxing. 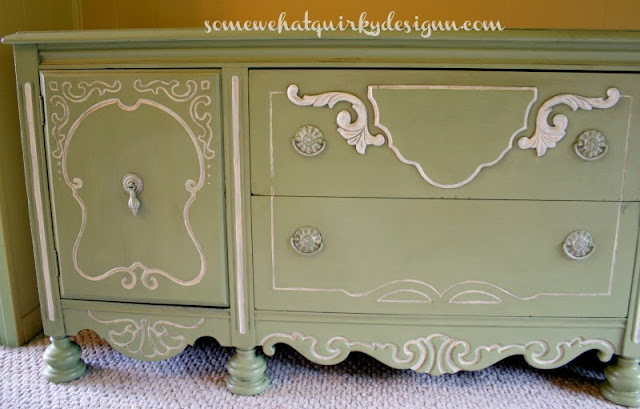 Which reminds me - we used Miss Mustard Seed Furniture Wax and Antiquing Wax. I am CRAZY for them. Both waxes are extremely easy to work with. This was only my second time to work with them. The first time I worked with them was just a few days before I left for my trip. I was really relieved that I liked them so much since this is what I had suggested that Danni order. Didn't she do a great job? What do you think of the color? I encourage you to check out these Power River Paints. They have a beautiful turquoise (which I was unable to talk Danni into) that I am anxious to try. I have to say that I'm glad she picked the green - since practically everything in her house that isn't neutral or white is - you guessed it - GREEN. I also want to make a shout out to my good friend Kirby@Kirb Appeal. You may or may not know that she has a second blog Women Who Blog. On this blog she interviews - wait for it - WOMEN WHO BLOG! Every now and then she sneaks in a writer of books and this is one of those weeks. This writer is so famous that unless you are a complete non-reader you have read at least one of her books. Don't miss this interview with one of the busiest female authors out there - Janet Evanovich! Check it out here. I love that green! Looks fabulous but I agree those two pieces need to be either removed or distressed to make them look less like an add-on. 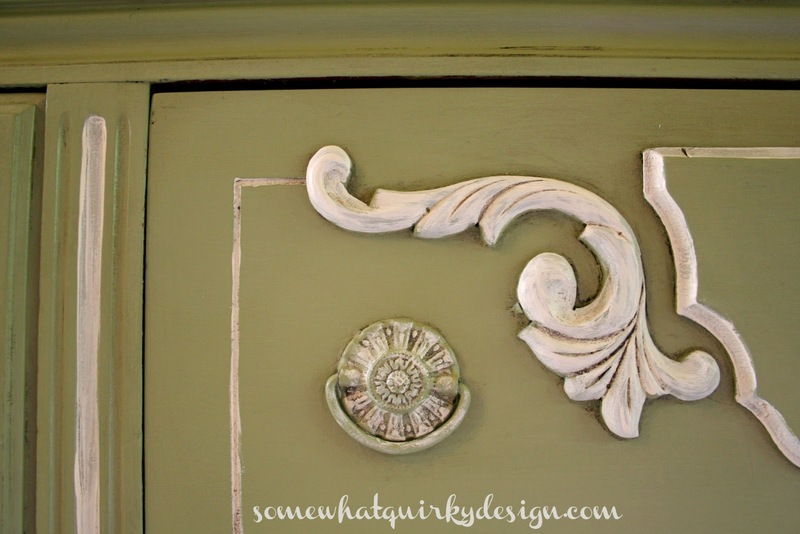 Well you may just have converted me Karen - that is one gorgeous Green - kind of reminds me of Annie Sloan's Versaille, right? AND I have to say Danni had a brilliant idea sawing the legs down - it's just beautiful as a console - she's a genius, that one! The buffet is just beautiful! I love the color choices. I agree with you re. 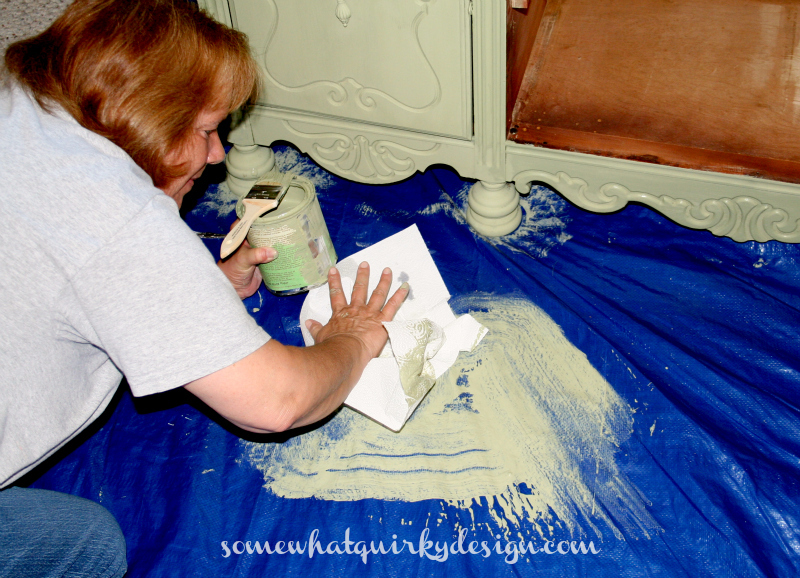 accent painting--it's hard to paint over thicker paint with more thick paint. It's gorge! And thanks so much for the shout-out, as well! That green is gorgeous and I love the white trim. You guys did a fabulous job. I agree the top draw has added appliques, but the piece is beautiful with or without them. Thanks for the awesome hands-on painting lessons! I cannot walk through my living room or bedroom now without thinking of our visit and the fun we had! You are one great teacher Karen! That came out just lovely Karen and Danni!! Thanks so much for the mention about the Powder River paint too! I'm glad you liked it! I haven't even tried the Prairie Grass shade yet...looks great! I love green, too. No complaints from me when I see a fresh coat of green paint! Great job, you two. I'm liking the MMS wax, myself. Good stuff! This is such a pretty piece. Love the colour, and the accents, what a great looking piece. Love how that shade of green looks on that piece. It turned out so nicely. Your post is extremely helpful about the kinds of paint you were dealing with. It helps to know how to use the paint and particular brushes, how to deal with any possible problems. It's always good to know about products used by professional painters. Glad you shared this project. oh, I love this...I have buffet envy! 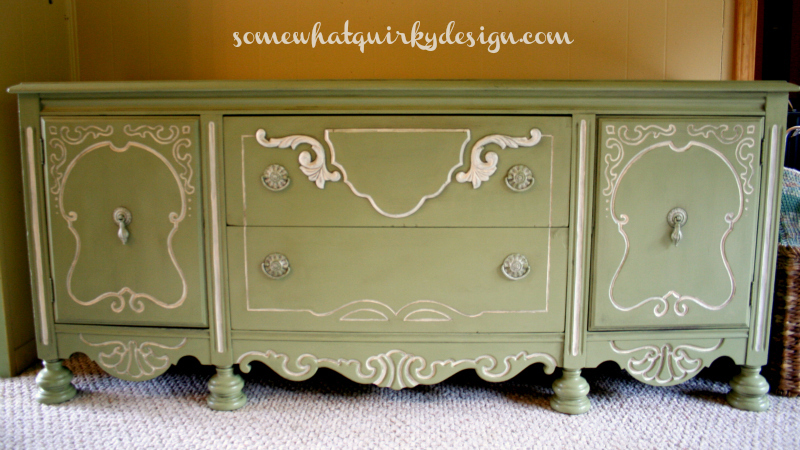 wow, I love everything about this piece, but especially the white accents pieces. Prairie Green is a beautiful color, it reminds me that I need to get more creative with my paint colors. Beautiful recreation of the buffet. We are so happy to see magic created with our paint. Hope you will have many happy times with Powder River Organic Paint! Thank you for featuring our product. I have been waiting for Danni to paint furniture. Glad you were there to guide her. This turned out beautiful. What better way to spend the day than hang out with Danni and paint. The piece is just beautiful, and how creative that she cut down those legs, it really gives the buffet a unique foot style. Love how this piece turned out! You two did an amazing job! 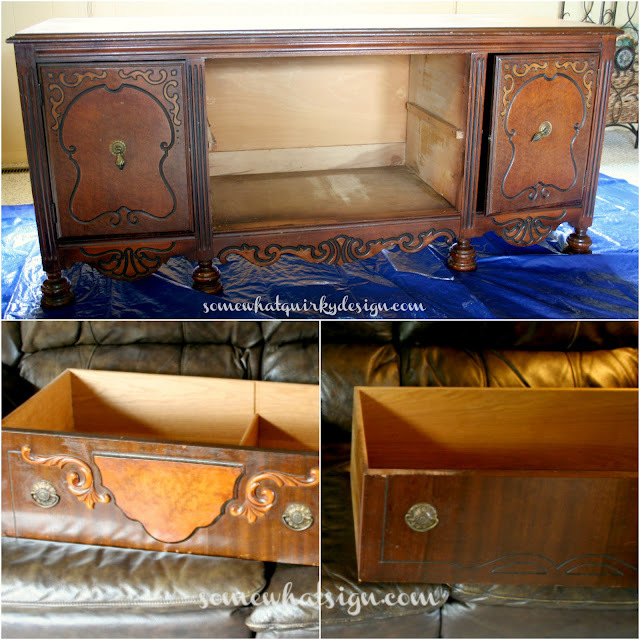 I'm over from Danni's site, and I have to say, that's one fine looking piece of furniture! What a great job she did, for the first time, too. I'll have to follow you now, she says you are an amazing teacher and maybe I can pick up some tips from you. I love MMS waxes too, they are so easy to work with. It did turn out gorgeous, and you were awesome to go meet her and help!